There’s no doubt that the Christmas season is one of the most expensive holidays of the year. From foods to decorations, it really cost a lot. Not to mention, you have a long list of gifts for loved ones that’s causing a strain on your budget. 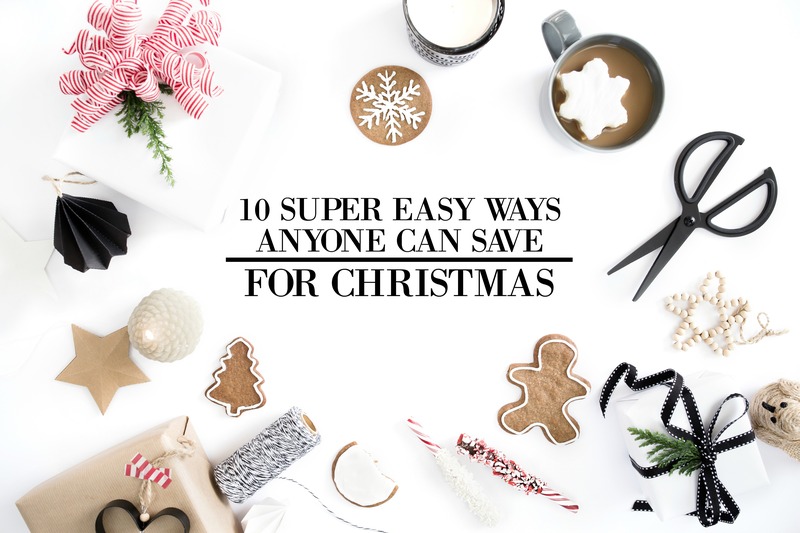 But with a little planning and strategizing, you can save more money this Christmas. Down below are some ideas that’ll help you save this holiday. They are easy to do, motivating, and practical tips. It’s much easier to get ready little by little than splurging all at once. So check them out and let me know what you think. Keeping an eye on things that are on sale monthly can save you a lot. For example, there are plenty of end-of-summer sales every year. You can find cool shirts, shorts, slippers, or anything that can be a gift to anyone. In this way, you’ll avoid the Christmas shopping rush and save more time and money. It’s a good idea to save money ahead of time for Christmas. Not only will you have enough to fund all of your gifts (and fun festivities!) but it will also lower the stress of breaking your budget. Opening a separate savings account for your Christmas expenses will help you to be disciplined about putting aside money and not touching it. Visit a bank near you and talk about their holiday savings account. One of the most priceless gifts that you can give to anyone is by doing it personally and handmade. Hop onto Pinterest or Youtube to get some free Christmas gift ideas that you can make. List all the materials you need before buying them and make sure to follow all the instructions so everything turns out right. Your loved ones will definitely be impressed on what they’re going to receive. So much of the time, we’re not aware of all the small purchases we make every day. And when added all together, it can turn into a large amount. Let’s say you spend $5 on lunch every day. If you stop buying lunch and make it from home, you’ll save around $150 a month. If you spend $4 on a cup of coffee everyday, cutting it out will save you another $270 a month. That’s $270 saved just by making your own lunch and coffee! So cutting out unnecessary expenses can help you save more money for the holiday. Not to mention, preparing your own meal and ditching the fast food can help you stay healthy too. This may sound a little silly, but here’s what I’m gettin at. Asking people what they want can totally save you a lot of money. You’ll be saving time because you already know what to find and avoid buying unwanted gifts. Also, you’ll be saving money as well because you can look for an alternative option or much cheaper brand of the present that they want. Christmas dinner is one of the biggest expenses of the holiday season. With a lot of food and drink to prepare, it can cost you a pretty penny. An easy way to cut down expenses is by inviting friends to come over and have a potluck dinner. Each guest will bring a dish that’ll make your table festive and full. Also, you’re not going to feel responsible for a lot of cooking and save yourself more time and money. You should be asking yourself this question every time you shop, but if you’re not, now is a good time to start this habit. Thinking about this question before buying things can help you decide if you really need it or you just want it. In this way, you can know if it’s a priority or you can wait until the holiday is over. Who knows, someone might buy it for you. Regularly checking your credit card rewards can help you give keep eye on your current reward points. If you think you’ve earned enough, redeem it and take advantage of them. These points could possibly help you with your holiday festivities and buying presents. Having a change jar is a simple and smart idea to save money. And it doesn’t just have to be one jar. You can have multiple over the year. And before you know it, those jars will be enough to buy presents. Need some extra cash? Why not turn your unwanted stuff into something profitable. There’s plenty of websites where you can sell items. Dust them off, clean them, and sell them online. Who says you have to break your Budget when Christmas comes around? There are plenty of tips and tricks that can cut your spending and increase your income. Just be mindful that’s it’s up to you to stay focused and achieve your goal. It’s the little steps that can bring you into bigger possibilities. So give them a try and let me know what you think!